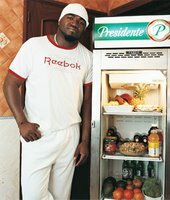 Rachael Ray talks with Red Sox slugger David Ortiz about what is in his fridge. RR:...You have tons of fruit and lots of broccoli, avocados and tomatoes. That fruit that looks like a coconut, what is that? DO: They call it mamey. The juice looks like carrot juice, but it's a little thicker and it tastes really good. You mix it with milk, ice and sugar. RR: That sounds good. I'll have to check it out. Hey, how's the seafood in Boston compared to home? DO: It's really good because Boston is right next to the ocean. In America I have this guy who gives me any kind of seafood, anytime.